Celebrations are important and it’s good to acknowledge achievements, no matter how big or small. After an intense and busy couple of months, that was exactly what our evening out at Gallipoli Again was. A time to relax, catch up and reflect on the successes of the past few months. 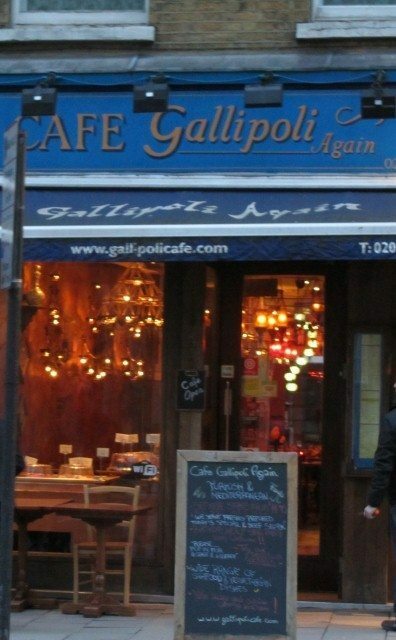 Gallipoli Again is part of the Gallipoli family of restaurants on Upper Street. 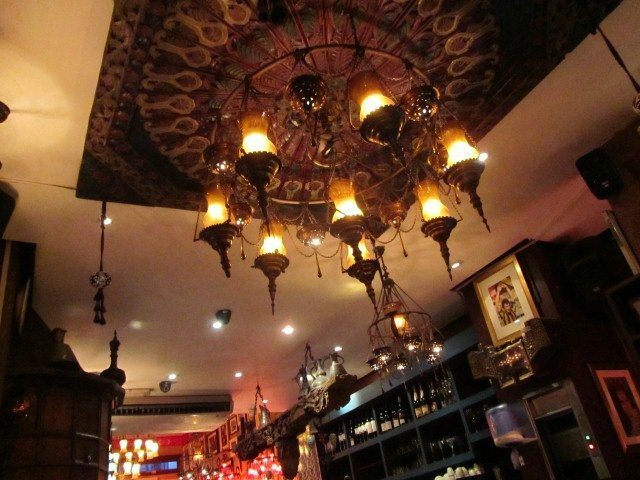 Clusters of ornate lanterns hang from the ceiling creating a soft ambient atmosphere. 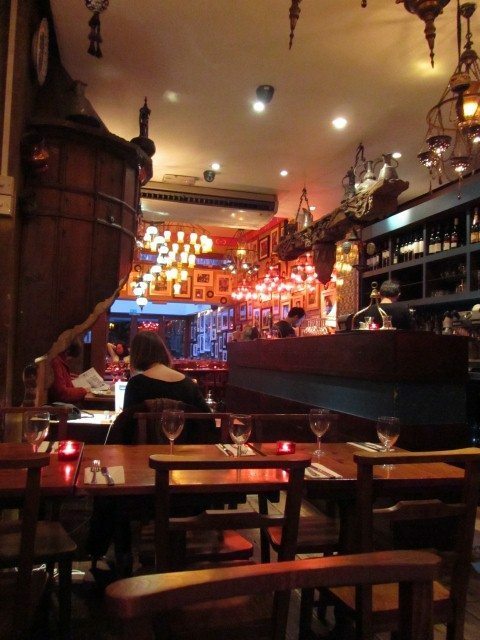 Carved wooden shelves, walls lined with pictures and dark furniture sets the scene for the restaurant. There is definitely a lovely warmth about the place. The staff were really welcoming, friendly and gave us good service. A feast for the evening was called for and nothing less was on our minds. 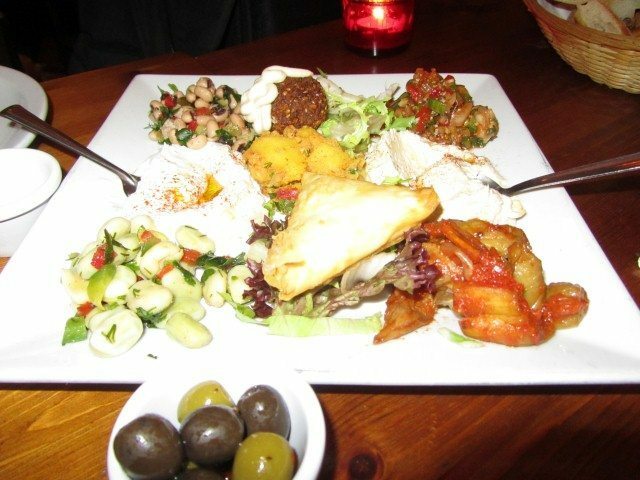 The Gallipoli Mixed Mezze seemed to have a good selection of the dishes and it saved us from having to make the hard decision of which of the many starters to chose from. The mixed platter had humus, borek, cacik, saksuka and salads of potato, black eyed beans, kisir and bakla. The freshness and flavours of the salads was great. My favourites were the aubergine Saksuka, Potato Salad and Black Eyed Beans. The Saksuka had soft strips of aubergine mixed with carrots and potatoes. The Potato Salad was slightly spiced and flavoured with parsley, herbs and lemon juice. The combination for the Kisir was crushed wheat, mint, tomato paste, spring onions and nuts. Broad beans with dill and garlic made up the Bakla. 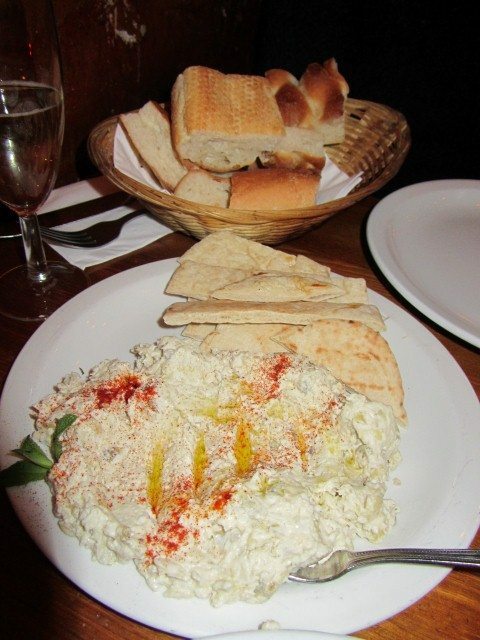 For the dips, there was the classic Humus and also the yogurt Cacik. The coolness of the cucumber and mint contrasted the garlic in the Cacik. The other main components of the Gallipoli Mixed Mezze were the deep fried Falafel and the Borek pastry. I always have a tendency to like the feta cheese and parsley Borek more than chickpea and broad bean Falafel. Olives and breads were also served with our vegetarian Mezze. If that was not enough, we had to follow our temptation for the Baba Ghannuge. Although lighter than the Humus, this smoky aubergine puree was just as tasty. Something as humble as the aubergine was transformed to a delicious addictive dip to accompany the pitta bread. 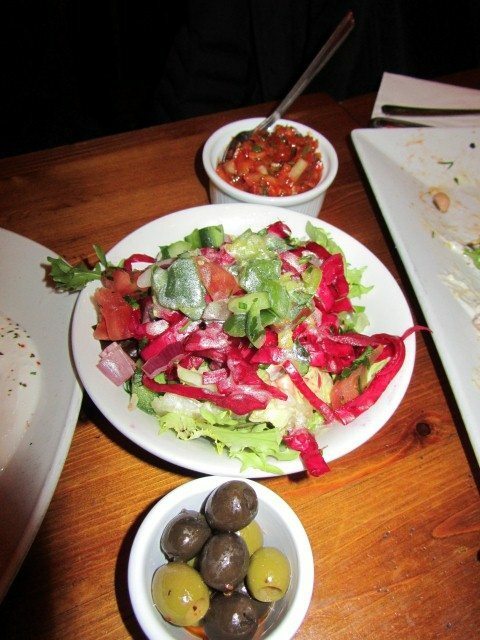 The starters at Gallipoli Again sure were filling but we had already ordered our main dishes at the start of the meal. So after a while, we were ready to sample the main delights. It seemed that it was an aubergine day for me. 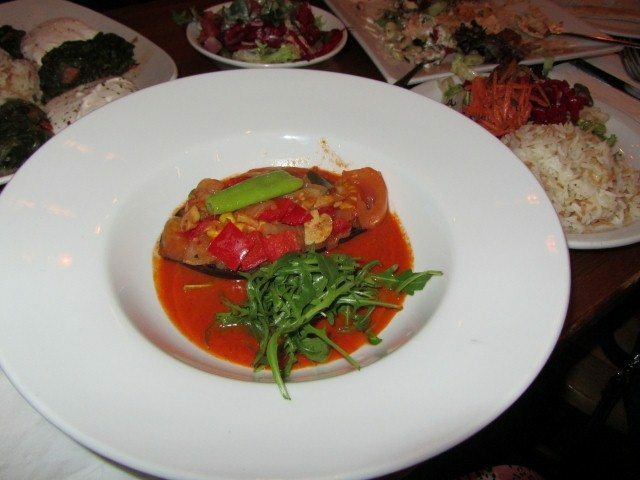 Imam Bayildi was aubergine filled with mushrooms and onions and topped with peppers. The tomato based sauce that it was served on was tasty. The main dish was delicious and it came with rice and salad. 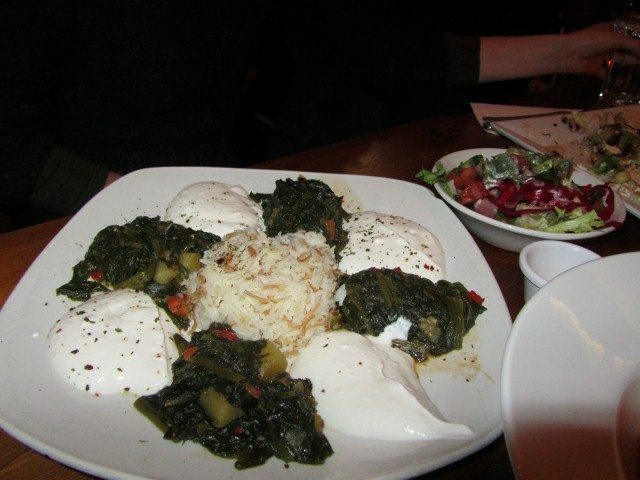 Softly cooked spinach with potatoes, presented with yogurt and rice was the other main choice. The portions were of a big size but Gallipoli Again does not compromise its quality of food in any way. 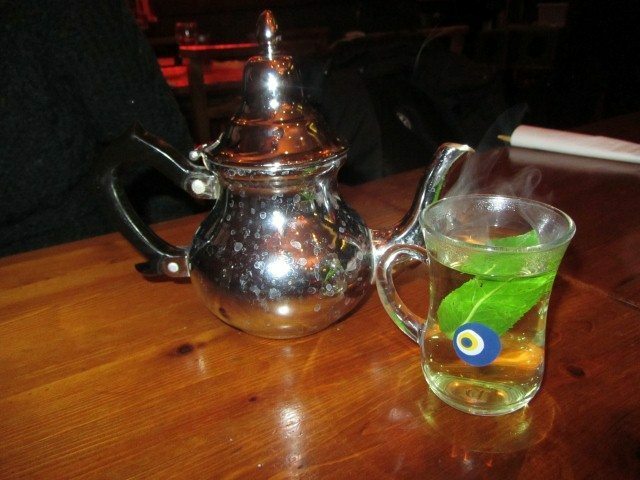 After all the food, fresh mint tea was called for. A small silver teapot with a cute glass was how the refreshing tea was served. Gallipoli Again really does do amazing cuisine and it made for a memorable celebratory evening. It would be interesting to see how the other two Gallipoli restaurants on the same road compare with this one. If they are anything like this one, then it would definitely be fantastic food.